Whether you work in an office, shop, restaurant or any other type of premises, you need to ensure you have adequate fire protection in case of an emergency. Fire alarms can save lives so if you don't have one installed on your business premises (or indeed your home) you could be putting the lives of your staff, customers, clients and family at risk. Where do you start with choosing the correct fire detection system for your business? Start by following the useful guide below that are provided by Alex Abossein. What type of fire alarms is there? Wireless (or radio) fire alarms are one of the best options for buildings which need to have alarms installed without wiring. These buildings can include those of historical importance such as churches, stately homes and listed building as visible wires on these premises would ruin the overall look of the building. Wireless alarms are also a great solution for premises which cover a lot of different buildings such as schools or business parks as extra units can be fitted quickly and easily to these buildings and of course all of them are fitted without wires. You can't be at your premises all the time, even if you do enjoy your work! Remote monitoring fire alarms can help keep your property safe even when no one's there. If a fire breaks out in the daytime, then the alarms can be set off quickly and everyone can be safely evacuated. At night time or over holiday periods such as Christmas there's unlikely to be anyone around to raise the alarm should a fire break out. Remote monitoring fire alarms allow your system to be hooked up to a monitoring service which means the fire brigade can be contacted at all times so your property is protected 24/7. For smaller offices or shops, conventional fire alarms are usually sufficient. These systems have detection zones which the traditional alarm features are connected to, such as heat detectors, smoke detectors, and glass-break fire alarm points. The central control panel usually alerts you of which area the alarm have been triggered so you can pinpoint the fire area and ensure a safer evacuation. 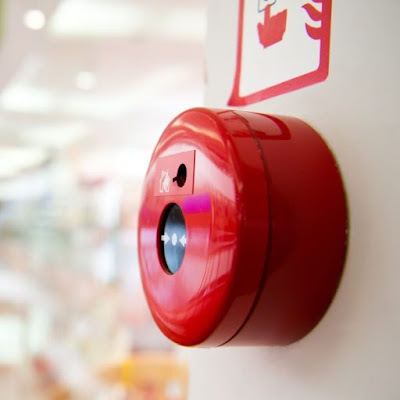 A larger business premises such as office blocks or large retail outlets like shopping centers can benefit from the high tech features of addressable fire alarms. Addressable fire alarm panels feature a number of loops where various alarms, smoke detectors, and glass-break points can be connected to improve the fire safety of a property. When a smoke detector on the loop senses a fire, this information is transmitted to the panel, which then processes this information and decides whether it is a fire or not. The addressable panel can alert you of the exact location of a smoke alarm or which glass-break fire alarm point has been triggered. This means that you can use this vital information to guide your staff and customers away from the source of the fire. Fire safety in the workplace is a serious business so make sure you have the most appropriate fire detection system for your property to ensure everyone stays as safe as possible in an emergency.